Yes, they do look a little young, don't they? This new group, Sweety, has a average age of 10.5. As this article tells us, there's a seven year old, two eleven year-olds, a 12 year-old, a 13 year-old, and three 14 year-olds. Oh, and one boy, a 10 year-old 'rapper'. The article also mentions that this group (created by Basic Entertainment, about whom nothing turns up when you search their name using Naver) may be part of a trend moving towards performers debuting at younger ages. Most of them had appeared on TV (like Star King) or were models already. Of course, what you really want to see is the video, right? Well, maybe not, but it's like a car crash - it's so very, very hard to look away. Of course, if you gaze into the abyss, etc, etc. There are many ways to respond to this. Some might fear that the apocalypse is upon us, others might give in and embrace it and make the image on this page their new blog banner, others might worry (as Lester Bangs did in his article "James Taylor Marked for Death") that they may end up on television covered in the blood of the producers responsible for this and, staring wild-eyed into the camera, repeating the words, "We did it. We won," over and over again, while some might opt for a Kurtz-ish cry in a whisper at those images, at that vision, 'The horror! The horror!' Not me, though. My (rather cathartic, I think) response was to open Aphex Twin's "Come To Daddy" in a new window (the music starts at 1:15 or so) and play the music over the Sweety video. 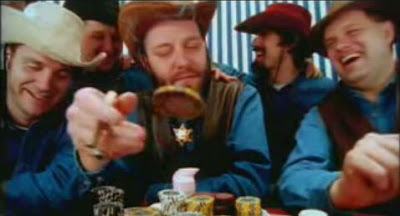 Trust me, it really does take the edge off, and is probably a much more appropriate accompaniment to the images above. ...to the 'hip-hop pose' of the boy to the... saluting? It would seem James is right about the degree to which Korean society is influenced by militarism. 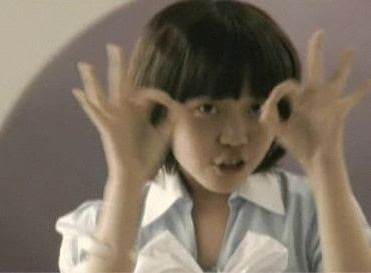 The girl above is the pint-sized female rapper, who constantly winks and points at the camera, but in this picture is mixing it up by making a heart. The only boy in the group seems to be a pint-sized pimp. 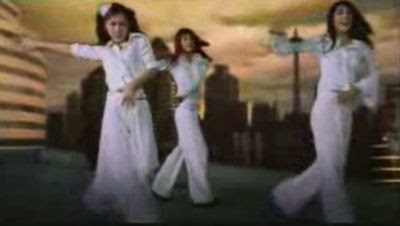 The girl above looks ready to ddong-chim someone, while the other clasps her hand all purity-of-essence style. 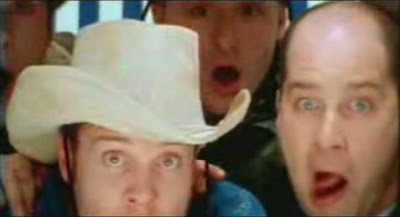 Sure, I'm poking fun, but it's worth noting that not only do they have numerous performers of different 'styles', hoping to appeal to as many tastes as possible, they also are sporting as many gestures as possible. 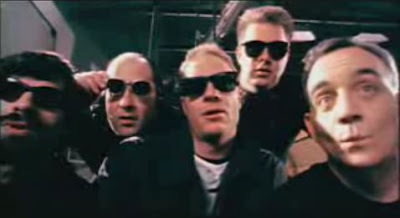 Drawn from commercials, eoljjang websites, music videos, and tv shows, they're essentially the visual catchphrases of the moment, and by employing as many of them as possible, the producers are essentially throwing everything that is seen as 'cool' at the wall to see what sticks (and they're not alone in doing this, of course). 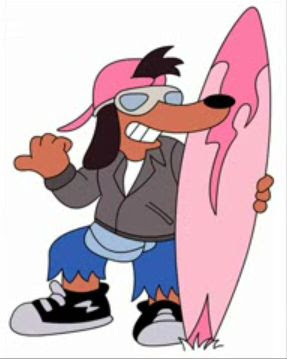 In this, the video and promotional photos remind me of Poochie. 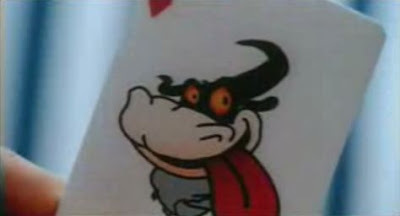 In the 1997 Simpsons episode "The Itchy & Scratchy & Poochie Show", the makers of Itchy and Scratchy decide to add a new character to improve ratings, and end up combining every popular fashion, visual cue, and catchphrase in an attempt to create a popular character. (playing guitar) Wiggity wiggity, Word up? Rock on party! Catch you on the flip side, dudemeisters. 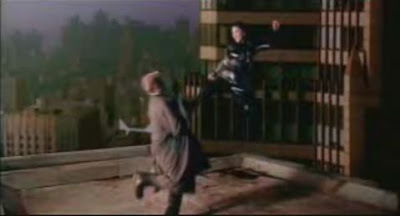 Not!! Hey kids, always recycle... to the extreme!! Bust it! Viewers hate Poochie, and as Lisa puts it, "Poochie was a soulless by-product of committee thinking. You can't be cool just by spouting off a bunch of worn-out buzzwords." When The Baffler revealed the hoax, the Times demanded an apology from Frank and his fellow editors, but received instead a surly response which read "(W)hen The Newspaper of Record goes searching for the Next Big Thing and the Next Big Thing piddles on its leg, we think that's funny." If that happened to one of the big three papers here, I'm sure they'd get the GNP to pass a law preventing the Baffler from publishing in some way, much as they're doing to the portals at the moment. At any rate, if music and its marketing are to be nothing but visual, verbal and musical catchphrases, I don't see a lot of hope for the musical side of the Korea Wave having much long term success with anyone other than the built-in audience of teenage girls that seems to exist for such idol groups. The Donga Ilbo unsurprisingly argues that netizens are using rumors about Dokdo to try to rekindle the candlelight protests. Something I didn't mention below is that all of the photos of the protest last night show very few 'Dokdo' related signs - most of them are typical candle girl (or boy) posters and anti-LMB posters - suggesting that perhaps the media is making too much of it - for now. 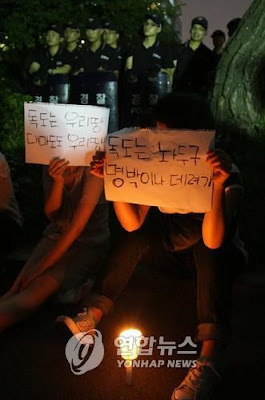 So the candlelit protests continued last night at Cheonggye Plaza, but with an additional issue tacked on: Dokdo. Why might that be? President Lee Myung-bak will recall South Korea's ambassador to Japan Wednesday in protest of Tokyo's decision to define South Korea's easternmost islets of Dokdo as its territory in guidebooks for history teachers. Minister of Foreign Affairs and Trade Yu Myung-hwan also called in Japanese Ambassador Toshinori Shigeie and delivered a message of protest. The strong words came after Tokyo said it would refer in a middle school teaching guide to the islets as Japanese territory. The document for teachers and textbook publishers is non-binding, but will likely influence textbook contents. 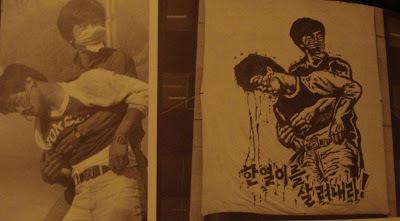 The poster on the left says "Dokdo is our land. 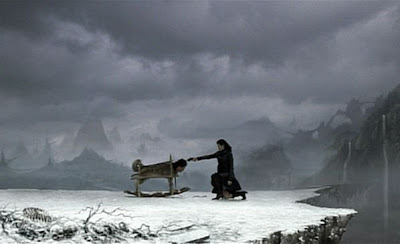 Daemado is our land." Daemado is the Korean name for Tsushima Island, which played an important role in relations between Japan and Korea in the past, and which, during the Dokdo controversy in 2005, was declared Korean territory by the city of Masan, who decided to have their own Daemado Day, which was not particularly appreciated by Seoul (more information here too). It's much easier to travel to Tsushima from Korea today (which is closer to Tsushima than mainland Japan), though apparently some Korean tourists' antics aren't always appreciated there. I mean, if you can't use an image of a giant Yu Gwan-sun chasing Tokugawa era Japanese sailors away from Dokdo to sell chicken, then what can you use? I'm sure she would appreciate that her sacrifice has been put to good use. This lengthy article (may freeze firefox) looks at the patriotic bomb throwers of the colonial era who did a bit of property damage and hurt or killed a few people, and at the end we're told ‘Our lives today would be very different if these men had not sacrificed themselves.’ Actually, I doubt they changed much, unlike the peaceful protesters who took part en masse in the Samil Uprising in 1919. The aftermath of the uprising led to the implementation of the cultural policy, while the bomb throwers changed nothing in the events leading up to Korea's liberation at the hands of the allies. I understand that heroes would be made of these men (and other, more famous patriots and assassins), but what was it all for? So they could be used in chicken ads? Perhaps one day the famous photo of the Kwangju Uprising seen here will be used to sell chicken (all you need to do is replace the baton the soldier is holding with a drumstick) - a process perhaps helped along by the Hankyoreh cartoon also displayed in that post. Think of how you could dress up statues: Yi Sun-shin could be holding a bucket of fried chicken, MacArthur could be holding a chicken burger instead of binoculars - the possibilities are endless! And they're about as tasteful as trying to claim Daemado after hundreds of years of Japanese living there. Or if you call it art and say you're being ironic, then you could have a lot of fun with altering images. I found these in a magazine (I forget its name, but it was well worth browsing through) at Vinyl in Hongdae, and snapped a few pictures. 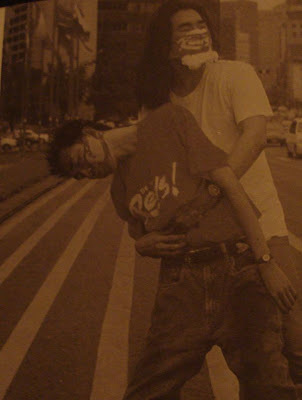 The first photo is of Lee Han-yeol, moments after he was fatally injured by an exploding tear gas cannister on June 9, 1987. To its right is a banner made of that photo. Below is what I took to be an ironic take on the photo, obviously made during or after the 2002 World Cup. Using a famous image of a tragic moment like this to comment on materialism or nationalism (or whatever you want to make of it), to me, is fine, as long as you're not using it to sell something. The Korea Times yesterday published an article titled "Christians Denounce TV Program for Humanizing Jesus"
A television documentary depicting Jesus as a human is drawing sharp criticism from Christian circles. While Christian leaders have called for the cancellation of the program, the TV network's union has vowed to continue the broadcast. The Christian Council of Korea (CCK), a group of protestant Christians, recently sent a complaint to SBS who aired the first episode of a four-part documentary "Shineui Gil, Inganeui Gil" (The Road of God, the Road of Man) on June 29. The CCK said: "What the program is trying to say could shake many people's beliefs. It is a violation of individuals rights to have freedom of religion guaranteed by the Constitution." 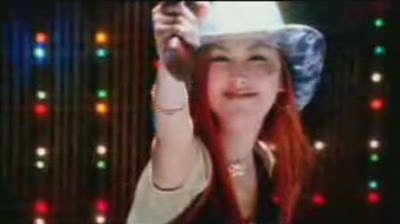 The group reportedly tried to cancel the show. The CCK started a hunger strike but halted it several hours later Sunday. The Korean Association of Church Communication said, "We are very anxious that the program is trying to tarnish the honor of Jesus, who is the God of 2 billion people worldwide. We will do whatever we can to stop the devious program." It is a violation of individuals rights to have freedom of religion guaranteed by the Constitution." "What the program is trying to say could shake many people's beliefs." How weak must the foundation of these people's beliefs be if they can be shaken by a documentary? Five of the world’s top architects will compete to develop a master plan for a $28 billion international business hub aimed at transforming the Korean capital, developers said yesterday. Each firm will be paid $1 million for its efforts [to design] the planned 57-hectare development in Yongsan District, close to the city center. A private consortium including Samsung plans to develop by 2016 the railway and warehouse area into a “Dreamhub” comprised of offices, a hotel, residential units and entertainment and cultural centers. The riverside site will link to a public park to be developed on the site of the current U.S. Army base, which is scheduled to move in two years. The contract is to design a landmark tower and create a master plan for the development, almost half of which should be parks or roads. Developers and architects said they see the project as a chance to give the architecturally undistinguished city of 14 million [sic] people a new heart. U.S. firms Asymptote, Jerde, and Skidmore, Owings and Merrill are also taking part in the contest, with the winner to be announced in November. Construction work will start in 2011. The rendering above was apparently produced in 2004. Here's a more recent rendering, linked to the Han River Renaissance Plan. You can see the planned ferry terminal. As Gord noted, the rendering above "looks like something copied straight off the cover of an old SF pulp mag. Except the silvery "teardrop tower" in the middle would be a rocket ship beside which a buxom blonde would be standing." It would seem the above plan is unlikely to come to pass, what with 5 different architectural firms competing to produce new designs. Worth keeping in mind is that this is just one of several planned developments in Yongsan-gu. Below you can see that they also plan to develop an area near Seoul Station, the US Base, the Hannam New Town, (part of Itaewon (? )), and another project at far right I know nothing about. If all of these are followed through on, much of Yongsan-gu will be razed in the next 10-20 years. The three projects that are certain to happen are the Dreamhub, the 'park' on the US base, and the Hannam New Town, and the first two are likely to change central Seoul a great deal. On a related note, the Singye-dong neighbourhood near Yongsan station had lots of photos taken of it earlier this year (perhaps it's still standing, but is set to be redeveloped. Photos of the area can be seen here, here, or here. Last week the Korea Times talked about all the environmentally friendly bells and whistles going into the development of Magok-dong, which happens to be a very short walk from my house. Located in Seoul's Gangseo-gu, Magok district is to get an environmentally friendly makeover with a new name (Eco Energy Town of the Future). The district is to transform into an energy efficient zone that'll boast some of the world's best technology. Oh Se-hoon unveils the plan, July 3, 2007. Mayor Oh Se-hoon on Tuesday announced a long-term masterplan to transform Seoul into an attractive waterfront city with high-level tourist and transportation facilities. 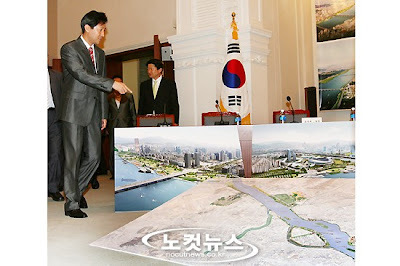 "The Han River is the last place in Seoul without proper development," Oh said in a press briefing. "I will redevelop Seoul into a pleasant and attractive waterfront city centered around the Han River under the 'Han River Renaissance project.'" There's apparently more to the plan than what can be seen above; this map shows that every riverside district (gu) is to get some sort of makeover along the waterfront. 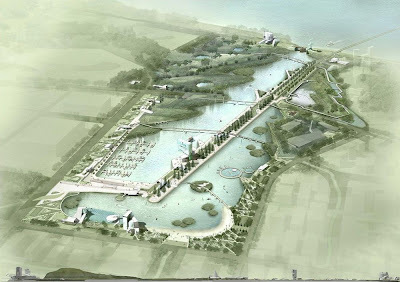 This page shows renderings of some of the different proposed redeveloped parks. The Jamsu Bridge, on the central section of the Han River, will become a pedestrian walkway from the later half of next year, the Seoul Metropolitan Government said yesterday. 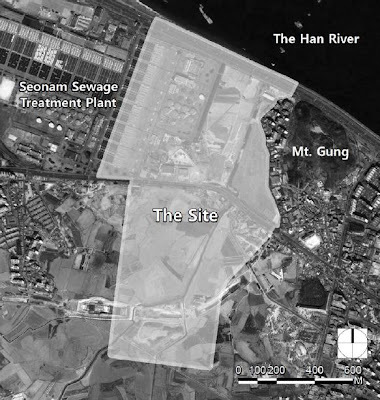 The change is part of a five-year, 253 billion won ($267 million) urban development plan, which focuses on adding more open space and strengthening the leisure infrastructure along the Han River, which is known chiefly for its crude, concrete embankments and jungles of cookie-cutter buildings. According to the plans, the city will spend 3.6 billion won to redesign the Jamsu Bridge, which is the lower half of the double-decked Banpo Bridge, as a pedestrian only bridge. Jogging courses and bicycle lanes will also be added. A 2,500 square-meter public park will be built at the southern side of the Jamsu Bridge, equipped with playgrounds and a water garden. Aside from the Jamsu Bridge, city authorities are planning changes to five other bridges to make crossing easier for pedestrians. Through the end of 2008, the city government plans to remove one car lane from the Yanghwa, Mapo, Hangang, Dongjak and Hannam bridges and convert them into walkways. To improve accessibility, the city will rearrange bus lanes to establish 14 bus stops on each side of the five bridges. The redesigned Jamsu Bridge (complete with fountains), as well the park south of the bridge, can be seen in this earlier rendering linked to above. As you can see, a man-made island existed in this plan. In late March of this year, an announcement was made that three islands would be built in the same area. 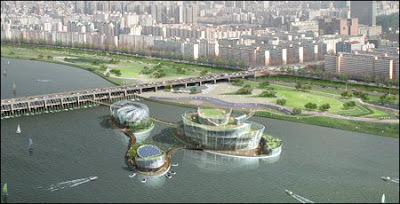 Floating Island will be built on Hangang near Banpo, the Seoul Metropolitan Government announced March 28. 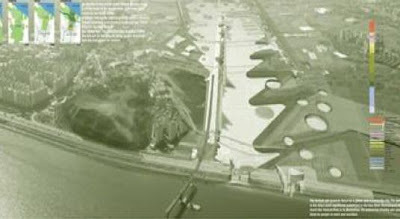 When completed in September 2009, the Floating Island, composed of three artificial islands, will have facilities for performances and exhibitions as well as festivals and sports and leisure activities. Floating Island boasting an eco-friendly design will be a new Seoul landmark, according to the City. Together with the renovated Jamsu Bridge and Jamsu Fountain, this area will become a tourist destination, the City said. Approval has been given to a new super tall skyscraper in Seoul, South Korea. 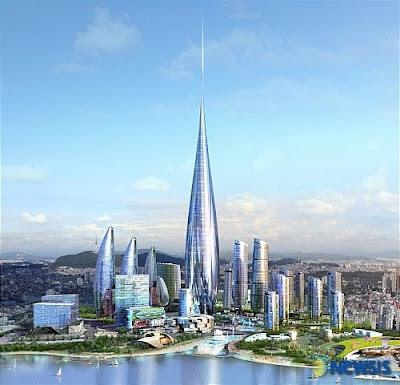 The project which has been undertaken by the Korean Rail Corp will upon completion stand at a healthy 615 metres which would make it the second tallest in the world, after Burj Dubai which standing at 830 metres holds the title at least for now. If the project is realised, work is expected to start on the tower 2011 and should be completed by 2016. 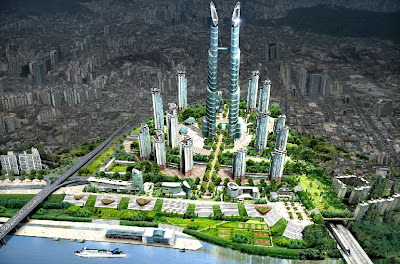 Whether this happens is another thing entirely as South Korea has an almost one hundred percent record of proposing super-tall towers that never get built. Read the whole article for more information. 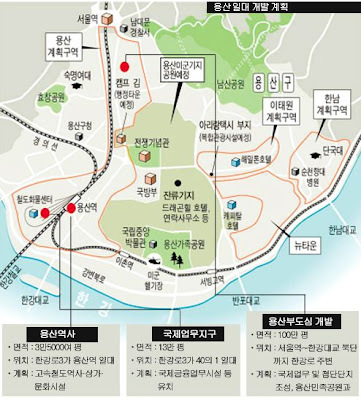 Worth noting is that the proposed waterfront park in Ichon-dong is, according to the map below, to have green corridors connecting it to the proposed park to be built in Yongsan after the US military leaves the Yongsan base. Note that at the top, Yongsan park is to have a corridor linking it to Namsan. 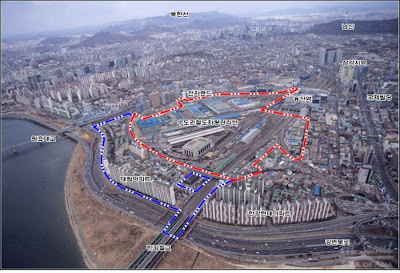 To the north, as we see here, the Seun Sangga redevelopment is supposed to provide a green axis (below, center) linking Jongmyo (and the palaces and mountains to the North) to Namsan. If these plans come to pass (in 15-20 years, I mean! 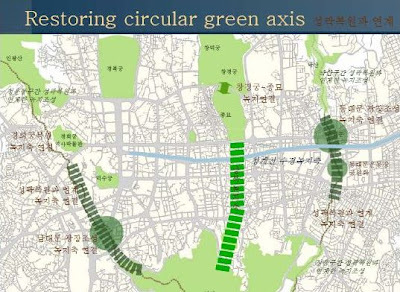 ), there will be a green link connecting Jongmyo to and Changgyeongung to the Han River. 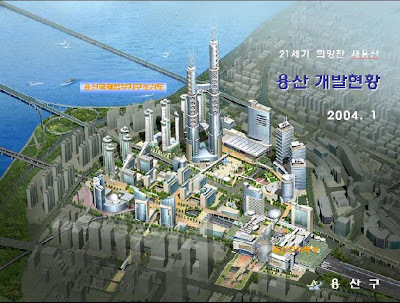 Of course, the city government has other links in mind for the Han River Renaissance Project. 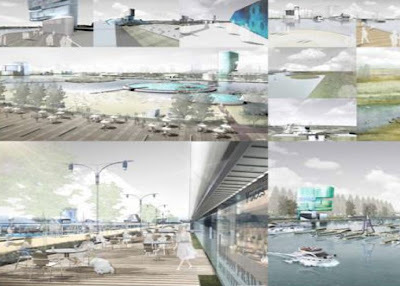 The most ambitious of the 33 sub-plans of the masterplan calls for restoring the waterway linking the river to the West Sea. Oh said international freight and passenger ships could reach the Chinese port cities of Shanghai, Tianjin and Qingdao from the river if the waterway reopens. There are two ways to link Seoul with the West Sea: One is to follow the natural flow of the river that joins the sea in areas just north of Ganghwa Island. The other is to use 20 kilometers of the "Gyeongin Canal" now under construction to link Seoul with the western port city of Incheon. The construction of the Gyeongin Canal has been suspended since 2003 because of opposition from environmentalists and civic activists. 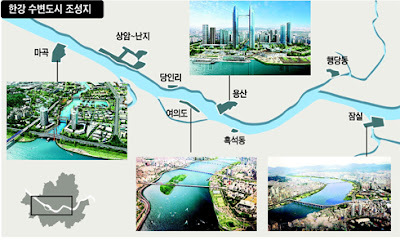 Seoul also plans to build an international terminal either in Yongsan or Yeouido and excavate the river bottom to create a depth of four meters in the river's main stream. "We believe either way would be possible with cooperation from the central government," he said. "If Seoul becomes an international port city, it would reduce transportation costs and attract more foreign tourists," he said. Thankfully, this plan did not come to pass, as in November last year, the city created an open competition for designs of the Magok waterfront, which can be seen in a pdf here. I first found out about the competition when Cosma, an architect from Naples, contacted me to ask questions about the Magok area since he had read my blog posts about Magok. I got to meet with him when he came to Korea a few months ago, and had an interesting conversation with him. Unfortunately, his project wasn't chosen, but I wish him best of luck in the future. Here is the site, as seen in the context of its surroundings. It was only when I saw this map that I realized they were going to remove part of the sewage treatment plant to make room for the park. Where it says 'Han River', the piles for the Incheon Airport Railway bridge can be seen. Here's a photo of the bridge taken last year from Mt. Gung, where the 600 year old Yangcheon Hyanggyo can be found. 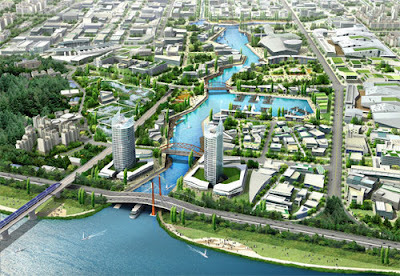 Magok is one of six proposed specialized waterfront areas comprising the Han River Renaissance Project, which is considered a priority project of Seoul. The Project aims to transform the overall landscape of the Seoul area by focusing on the development of six special waterfront areas along the Han River, which flows across the heart of the city. As the first of the six, the Magok Waterfront will play an important and symbolic role. 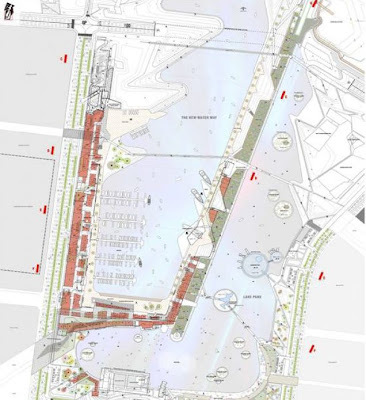 The size of the Site of the Waterfront is approximately 1,170,780 square meters. 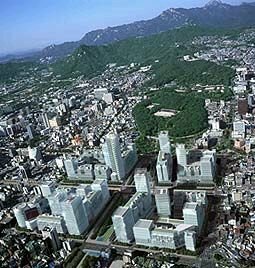 In 1995, Seoul announced a progressive plan to develop the city’s remaining large scale, undeveloped area, Magok. Under this long-term plan, Magok was to be systemically managed, and development was reserved for a later time so that preparations could be made in advance. Large scale development projects such as the Balsan Residential Area Development Project, the Banghwa New Town Development Project, the Gimpo Airport Comprehensive Development Project, and the construction of Subway Line No. 9 and the Incheon International Airport Railroad, are currently underway within and around Magok. Due to these rapid changes, there has been growing concern over excessive development of the surrounding areas and the need for systematic management. The project is to include a lake park and marina opening onto the Han River. Below you can see the Incheon International Airport Railroad (AREX) in yellow and Line 9 in green. The new Magok station will have exits opening onto the site. The blue lines represent the streams flowing through the fields and the reservoir that sits in front of a pump house which faces the Olympic Expressway (for drainage during floods). As for the expressway (and Yangcheon Gil) decisions had to be made whether to create bridges or tunnels to allow the flow of water (or boats, really) into the marina. There's actually an historical property I knew nothing about within the site, even though I'd seen it many times. It's marked above as the "old pump house." 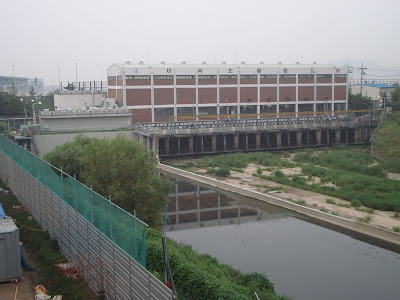 The former Yangcheon Water Supply Association Drain Pump Station was constructed in the early 20th century.[...] 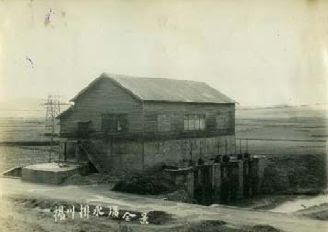 The old drain pump station is drainage facility of the early 20th century that is a registered cultural asset located within the Site. The old drain pump station is highly valued as a modern industrial historical asset. 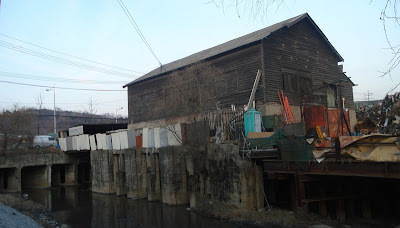 It is a modern structure and the only agriculture related industrial structure in Seoul. The old drain pump station is not currently used for any drainage functions but is used for the repairs of heavy equipment. If you continue through the bridge seen at left, you arrive at the reservoir, seen below. 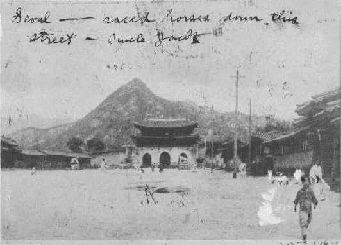 The bridge (where Yangcheon Gil passes over the stream) is seen at right, and off in the distance at left is the new pump house. The area below is normally swimming (?) with ducks. The new pump house abuts the Olympic Expressway. The winning project was Kim Gwan-jung's "Heart of Magok is Nature of Living Water". I don't have access to any large images of the plans, but it appears the diagonal raised area will cover much of the existing stream (and perhaps feed it into the reservoir, which still seems to exist in the plan above (though I see no indication of where a new pump house will be). The raised area also separates the marina from the lake park and also likely covers large parts of both AREX and Line 9. It also has chosen tunnels for the expressway and street. I don't see how cyclists and rollerbladers are supposed to deal with the breach in the Han River Park, however. Construction is to start in July next year and finish in June of 2013. This should make for a nice addition to the area, so I'm thankful for the Han River Renaissance Project, because I don't know if the city would have considered removing a large chunk of the sewage treatment plant to make way for a project this big otherwise. The local paper (Gangseo Magpie News) mentions that canals are going to be made linking the lake park with the rest of Magok-dong. Of course, it'll be 20 to 30 years before all of Magok is developed.